“I will be with you always until the end of the age” (Matthew 28:20). This is Jesus’ promise to His disciples (and to us) before ascending to the Father. If He was physically leaving, how could He vow to be with us forever? How can we know that God is with us today? How can we develop a relationship with the Creator of the Universe in a real and tangible way? The answer to all these questions is the Eucharist. The word “Eucharist” comes from a Greek word meaning “thanksgiving.” Just as Christ gave thanks for the gifts of bread and wine at the Last Supper, we give thanks for His eternal and true presence to us – in the flesh – but under the appearance of bread and wine, at every single Catholic Mass. The Eucharist is not merely a symbol, or a nice gesture, or even a dramatic “reenactment” of the Last Supper. The Eucharist IS God – Body, Blood, Soul and Divinity. The Eucharist is the Real Presence of Jesus Christ, just as real as the person sitting next to you. The Body and Blood still keep the outward appearance of bread and wine, but through the power of the Holy Spirit, while the “form” of the bread and wine do not change, their substance does. We call this transubstantiation (CCC 1373-77). Through the words of consecration being uttered by Christ’s priests, the Holy Spirit transforms simple bread and wine into the very flesh and blood of Jesus Christ. Why would we believe this? Simple, we believe it because Jesus said it was so. At the Last Supper, he said “This is my Body” and “This is my Blood” (Matthew 26:26-28). At every single Mass, those same words are spoken and the same miracle takes place. In the Eucharist, God fulfills his promise to “be with us always” in the most physical and intimate of ways. Because the Eucharist is SO IMPORTANT to us as Catholics, we make it VERY IMPORTANT to the camp. 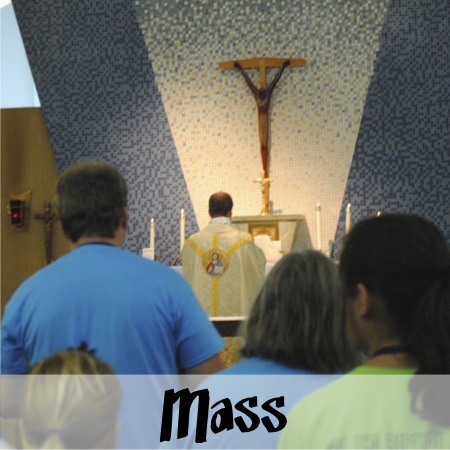 Mass is celebrated every day at camp. We make sure Mass is held before meals (or long after) so campers are not violating the fasting rules of Mass. 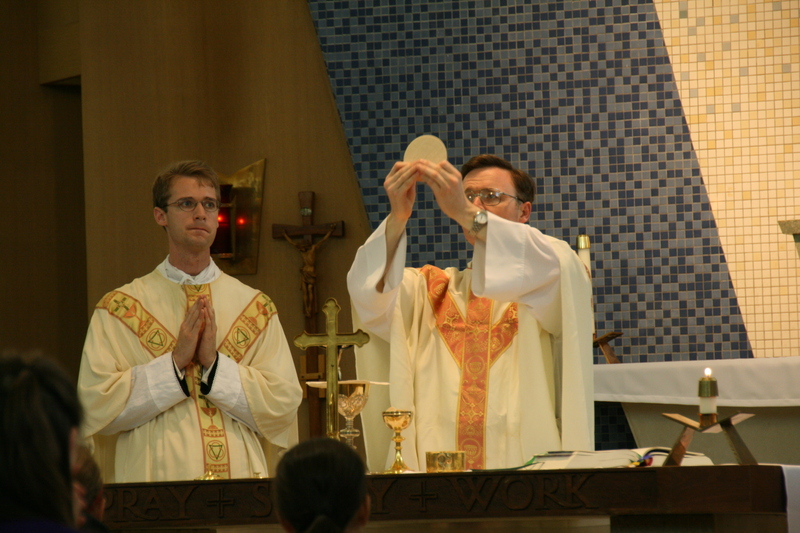 In 2012, we celebrated a traditional Latin Mass one evening – many campers stated it was their favorite part of the week.